The Intel® RAID Controllers RS3DC080 and RS3DC040 double the available bandwidth of current 6Gb/s SAS solutions, and offer a higher level of RAID performance and security compared to entry-level products. They feature eight and four internal ports respectively, deliver two 1.2GHz processor cores and 72-bit DDRIII interface that drives 1GB cache memory at 1866MHz. They support 8 PCI Express® lanes that comply with the latest PCI Express 3.0 specification with 8 gigatransfers per second (GT/s) per lane. Plus, each adapter supports 8 individual SAS ports operating at 12Gb/s. The adapters are backward compatible with previous PCIe and SAS generations through automatic negotiation and provide SAS data transfer rates of 12, 6, and 3Gb/s per lane, and SATA data transfer rates at 6 and 3Gb/s per lane. The Intel RAID Web Console 2 included in these adapters enhances RAID volume creation by empowering administrators to further optimize their storage for application performance and data protection. With an intuitive graphical user interface, this Intel RAID Web Console 2 deploys all the critical system storage functions and helps eliminate complexity and learning curves. Plus, since all Intel RAID solutions are validated across multiple platforms with Intel® boards, chassis, and systems, when used together they deliver the best combination of performance, built-in. 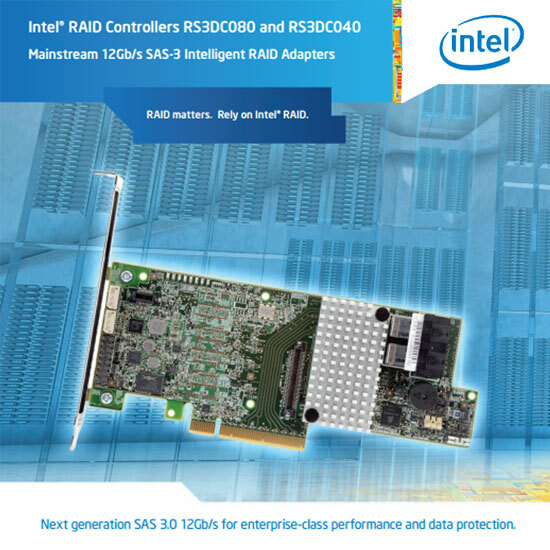 The Intel® RAID Controllers and RS3DC040, powered by LSI® MegaRAID® Technology, provides the next generation SAS 3.0 12Gb/s performance and security for mainstream server environments including database, e-mail and Web servers. Supports data redundancy using SAS or SATA hard disk drives through mirroring, parity, and double parity (RAID levels 1, 5, and 6) plus striping capability for spans (RAID levels 10, 50, and 60). 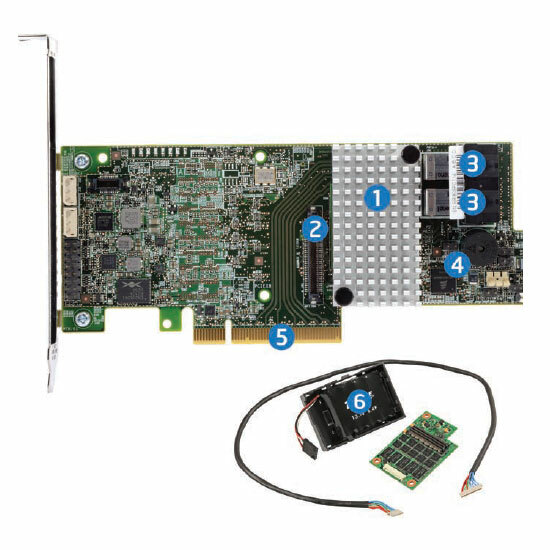 A dual core LSI® SAS3108 ROC, x8 PCI Express Generation 3 host interface and 1GB of 1866MHz cache enhance the performance of mainstream applications. With a true MD2 form factor, this adapter is ideal for low-profile height and halflength adapter slots. Eight internal 6 Gb/s SAS ports allow connection to 6Gb/s or 3Gb/s high-performance SAS drives, high-capacity SATA drives or a combination of both. Delivers proactive drive monitoring and automatic error correction. A new battery (optional accessory) offers multiple operating modes including high heat tolerance and 5 year service life options. FastPath I/O – previously an add-on feature — provides a high performance I/O accelerator for SSDs. The technology is designed to dramatically boost transactional application throughput, delivering up to 750,000 I/Os per second (IOPS) in RAID mode. Support for premium feature upgrades. The RS3DC080 includes a connector for optional hardware-based keys that easily plug in to unlock advanced software algorithms designed to improve performance and enhanced data protection. For instance the SSD Cache upgrade allows for using one or more SSD as enhanced cache for the RAID controller which can significantly improve performance of read-intensive applications, such as file, Web and online transaction processing servers. RAID Matters. Performance with Hardware ROC 12G.